US President Donald Trump announced that the US, along with France and Britain, has launched precision strikes against the Syrian government on Friday evening. The US has threatened military intervention over what President Donald Trump has described as an “atrocious” attack, which killed at least 40 people. Washington placed the blame on the government of President Bashar al-Assad, but Damascus has denied the accusations, saying the attack was the work of terrorists. The US already struck government targets in Syria last April, when Trump ordered a cruise missile attack on a government air base in response to a sarin gas attack on Khan Sheikhoun which killed more than 80 civilians. 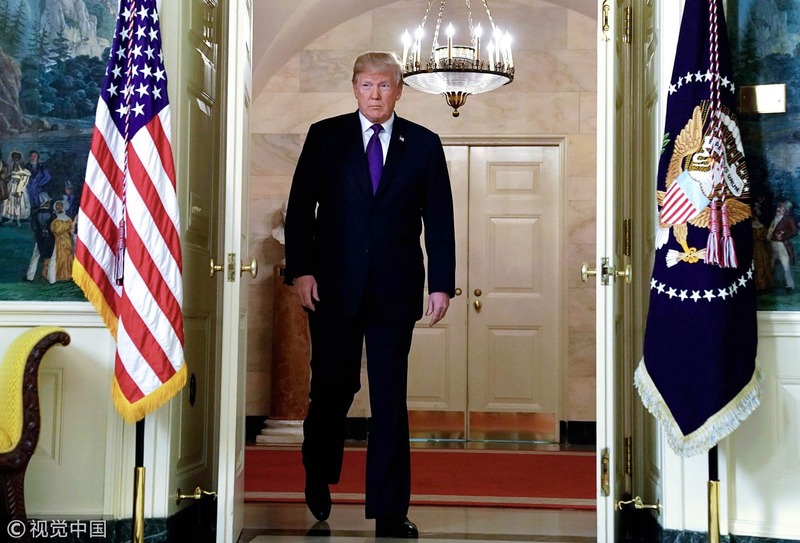 Shortly after Trump began his address, loud explosions were heard in the Syrian capital Damascus, signaling a new chapter in a brutal seven-year civil war. According to Syrian state TV, US started its military action against the capital before daybreak Saturday as loud explosions were heard reverberating across the capital Damascus with red dots seen flying from earth to the sky in what appeared to be air defenses responding to the US strike. “Syrian air defense blocks American, British, French aggression on Syria,” state television added. “The aggression is a flagrant violation of international law, a breach of the international community’s will, and it is doomed to fail,” SANA said. Syria’s foreign ministry denounced Western strikes as a “brutal, barbaric aggression” hours after the US, France, and Britain launched a joint operation against military installations. A statement carried by state news agency SANA said the strikes aimed to block a probe by the OPCW global chemical watchdog into an alleged gas attack outside Damascus. The attack “aims at hindering the mission’s work and preempting its results,” said the statement quoting a source at the Syrian foreign ministry. Meanwhile, chemical research centers in and around the capital were hit by the US-led strikes. “The Western coalition strikes targeted scientific research centers, several military bases, and the bases of the Republican Guard and Fourth Division in the capital Damascus and around it,” said the Britain-based Syrian Observatory for Human Rights. Trump said the strikes would aim to deter chemical weapons use by the Syrian government and stressed he was prepared to sustain the response until the government of Syrian President Bashar al-Assad stopped its use of chemical weapons. The US Defense Secretary James Mattis stated later on Friday that the air strikes on targets in Syria were a “one time shot” to send a strong message. The intervention was the biggest strike by Western powers against the Syrian government in the country’s seven-year-old civil war. British Prime Minister Theresa May later confirmed that she had authorized coordinated and targeted strikes against Syria with American and French allies to destroy Syria’s chemical weapons capability. British jets have fired missiles at a Syrian military facility near Homs suspected of storing chemical weapon ingredients, Britain’s defense ministry also confirmed later. French President Emmanuel Macron also confirmed that he had ordered French military intervention in Syria with the US and Britain. “We cannot tolerate the normalization of the use of chemical weapons,” he added. 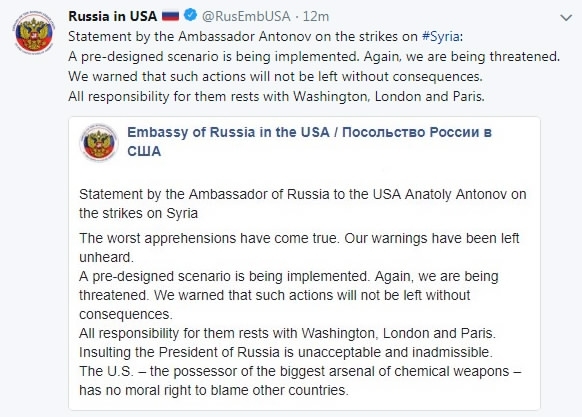 The Russia’s ambassador to the US Anatoly Antonov warned on Friday that there would be consequences for the US-led strikes on Syria, adding that it was not acceptable to insult Russia’s president. Zakharova suggested that Western media bore some responsibility for the strikes, claiming the White House cited “multiple media sources” on the suspected chemical weapons attack in Douma. “American and other Western media must understand their responsibility for what happened,” Zakharova wrote. Russian defense ministry reported the US and its allies fired more than 100 cruise missiles at Syria, a significant number of which were intercepted by Syrian air defenses. It added none of the Western strikes in Syria had hit areas covered by Russia’s air defenses, which were placed around its air base and naval facility. The Kremlin has yet to make any comments on the strikes. UN Secretary-General Antonio Guterres on Saturday called for restraint and for countries to avoid any acts that could escalate the situation. While the head of NATO expressed his support for Western strikes in Syria on Saturday. “I support the actions taken by the United States, the United Kingdom and France… This will reduce the regime’s ability to further attack the people of Syria with chemical weapons,” Secretary-General Jens Stoltenberg said in a statement. Seven Iranians were killed in an air strike on a Syrian military base on Monday, which Iran said was carried out by Israel. However, Israel believed the strikes are justified and it is an “important signal” to Iran, Syria and Lebanese militant group Hezbollah. Turkey and Canada also voiced support for Trump’s decision. Canada’s Prime Minister Justin Trudeau said in a statement that Canada supported the US, the UK and France to take action against the alleged Syrian chemical weapons attacks.